Microsoft is using two ideas borrowed from Apple and RIM’s smartphone dominance: Business app integration; and AT&T’s U-Verse to take on Apple TV. At a launch event today, Microsoft showed how it’s using two secret weapons to challenge Apple and RIM’s smartphone dominance–ideas it co-opted from them. Business app integration inspired by the BlackBerry, and AT&T’s U-Verse to take on Apple TV. AT&T’s Ralph de la Vega showed off a handful of Windows 7 phones that’ll be arriving on his network over the next month or so, and revealed an attractive $199 price point for all three–aimed squarely at competing with the iPhone 4 and many of the Android army of smartphones. But before he left the stage he revealed something even more interesting: A tight integration between AT&T’s U-Verse streaming content media system and Windows 7 handsets. 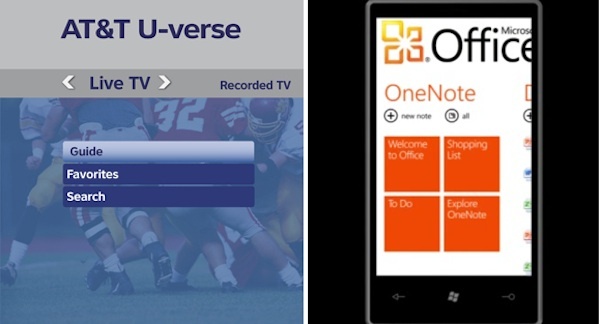 Existing U-Verse customers may well have expected to be able to access their system through Microsoft’s swanky new smartphone–after all, there’s an iPhone app for that, and AT&T was taking part in the Windows 7 event. There’s something extra though: De la Vega also revealed that non-AT&T phone customers will be able to access U-Verse for a “low monthly fee,” only via Windows Phone 7s. There’s also going to be Xbox Live integration. When MS’s CVP Joe Belfiore took the stage to demonstrate a Windows 7 phone, he ran through many of the OS’s innovative features–the fast-on camera mode being a particularly impressive piece of thinking (or “smart” design as Belfiore put it) about how many people want to use their phones in the real world. There was mention of cloud integration with Zune Market, social networking, and the close tie-ins with Xbox Live for rich gaming experiences that sync between the phones and your Xbox console. But Belfiore also took time to mention several of the Windows 7 “hubs” that are aimed directly at competing with RIM (and perhaps Apple to a lesser–but growing–extent). These are the business-friendly ones. For starters, Belfiore demonstrated a PowerPoint 2010 presentation, downloaded from an email, that ran on the phone as if it were on the PC that crafted it. While noting this is handy for reviewing content, perhaps if you’re on your commute to work, Joe also noted that with the phone connected up to a projector you may as well present the slides right from your phone, and not worry about hauling a laptop around. This is neat, but it is something that you’ve been able to do from the iPhone and iPad for a while from Apple’s own business productivity tools. The thing that will, perhaps sadly (if you’re of the opinion that Apple’s products are actually better–and if you’re a sufferer of MS Word, then you’ll definitely think this) carry some weight here is that word “PowerPoint.” Many an exec will latch onto the brand name and think of the benefits of the Windows phone. 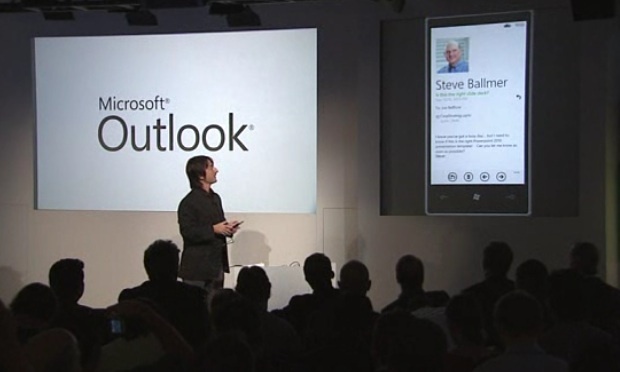 Belfiore also showed Outlook integration, noting how similar the email experience on the phone is to that which millions of business folks are accustomed to on their office machines, and even demonstrated a degree of cross-platform cleverness that sometimes seems missing from MS’s desktop experience–by showing how the phone OS detected a meeting suggesting in an email, immediately checked the calendars, and warned of a timing conflict. The “I’ll be late” button, which automatically emails people if there’s a delay while you’re en route is particularly clever. There was also some time spent demonstrating the OneNote note-taking app, which MS apparently thinks is central to a smartphone experience, and how it syncs to desktop or web-app versions of the system through the cloud. What does this mean? It means that Microsoft is hoping its virtual monopoly on business productivity software will help it sell Windows 7 Phones into the enterprise market, banking on the fact it has hugely saleable brand names here and that it automagically offers a tight integration with familiar desk apps that are missing from Apple’s, Google’s and RIM’s competing smartphones. It’s a trick that might work with many not-so-technically savvy users.